40' long roll of NEW Double Shielded Avionics / Strobe Light Cable. P/N B110622. Cable is shielded on the outside, wrapped in a clear plastic sleeve. Inside the outer layer of braided shielding there are 3 wires wrapped in colored plastic sleeves, (red, white and blue). Each of the 3 wires inside the colored sleeves are shielded again and inside that shielding there are two multi-strand #22 wires. This is a very high quality, very high $$ cable. 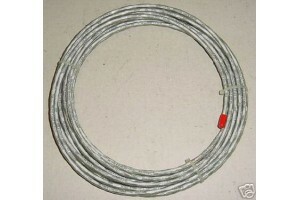 Manufacturer list price for the 40' cable is over $500!! It can be used for avionics installations or strobe light installations.